Ford’s new Super Duty pickup boasts best-in-class power and torque – at least for now. We’re used to seeing bold claims about the Super Duty pickup from Ford's marketing department. When it was introduced in 2015, Ford touted the all-new Super Duty pickup as the "" And now the F-Series Super Duty is about to get better in practically every way in 2018 as Ford is upping the ante even further by claiming that next year's model will be the toughest and most powerful heavy duty pickup ever. Packing the same 6.7-liter Power Stroke V8 as last year's model, the upgraded engine now produces 450 horsepower and an earth-moving 935 lb-ft of torque, giving it best-in-class levels of power and torque - albeit by a very slight margin, since it represents just a 10 hp and 10 lb-ft improvement over the 2017 model. Compared to the competition, the 2018 Ford Super Duty boasts five more ponies than the Chevrolet Silverado HD's 6.6-liter Duramax diesel, and beats the Dodge Ram's 6.7-liter Cummins diesel by just five foot-pound of torque. To help the 2018 Super Duty’s 6.7-liter Power Stroke engine deliver more power, the cylinder heads were redesigned to increase strength under higher loads. The fuel and turbo boost calibrations were also optimized to take advantage of the increased cylinder head capacity for increased horsepower and torque. As a result, Ford says the 2018 Super Duty delivers best-in-class towing with a gooseneck trailer at 34,000 pounds. It also has best-in-class towing with a conventional hitch at 21,000 pounds, and best-in-class payload capacity at 7,360 pounds. If you hadn’t gathered, Ford is keen to emphasize that the 2018 Ford F-Series Super Duty is the best in its class at just about everything. Bare in mind though that the gooseneck towing capacity relates to the new-for-2018 F-450 4x2m, which is primarily designed for hauling big trailers on the road. “Super Duty customers expect the best, and for 2018 we’re giving our customers even more power and torque from our 6.7-liter Power Stroke diesel – delivering the most horsepower and torque available among all heavy-duty pickups,” said Todd Eckert, Ford truck group marketing manager. “Plus, our new F-450 pickup now includes a 4x2 model, enabling our customers to get more done with the segment’s best payload and towing.” Scheduled to arrive in dealers this winter, prices for the 2018 Ford Super Duty F-450 4x2 pickup start at $52,830 in the entry-level XL trim. Other available trims include XLT, Lariat, and the range-topping Platinum model. 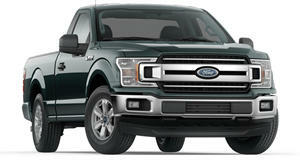 Very few vehicles in this class can match the Ford F-150’s breadth of ability.